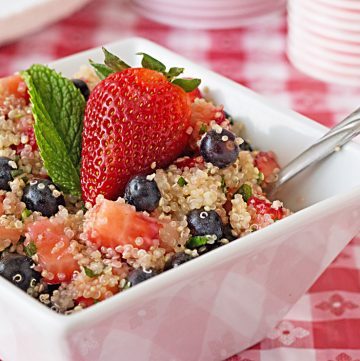 Quinoa fruit salad is perfect for any patriotic-themed holiday. This healthy salad recipe is vegan, gluten free, dairy free, protein-rich, and delicious! It’s my submission for day 2 of Kick Off to Summer Week, a multi-blogger event co-hosted by Lauren of From Gate to Plate and Summer of Summer Scraps. Memorial Day is less than 2 weeks away, and summer’s not far behind. That’s why we’ve teamed up to give you ideas for your warm weather party activities. Each day this week, we’ll be serving up a variety of recipes and ideas for you. Everything from appetizers, main dishes, and desserts, to decor and printables. We hope you enjoy all of these wonderful ideas! You can also follow #KickOffToSummerWeek2014 on Twitter to keep up to date with all of our spectacular ideas and giveaways. 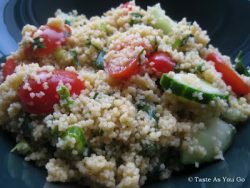 I adore the colors in this quinoa salad recipe, but I love it even more for its health benefits. It took me quite a while to jump onto the quinoa lovers train, but now that I have, I’m taking it to the end of the line with me. It’s starchy enough that I feel like I’m really splurging on carbs, but it’s super high in protein and fiber, making it a lower carb food. I listed some awesome #FoodFacts on quinoa in my vegetable quinoa salad recipe post. 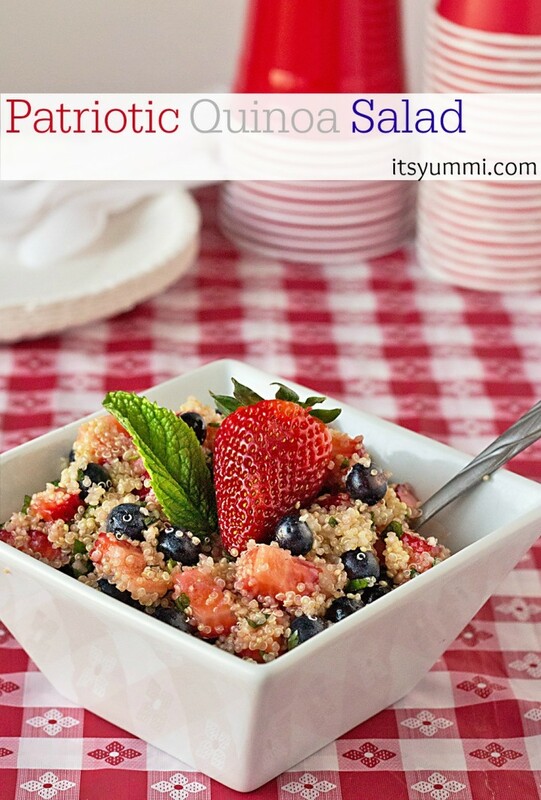 I hope you enjoy this quinoa fruit salad recipe! 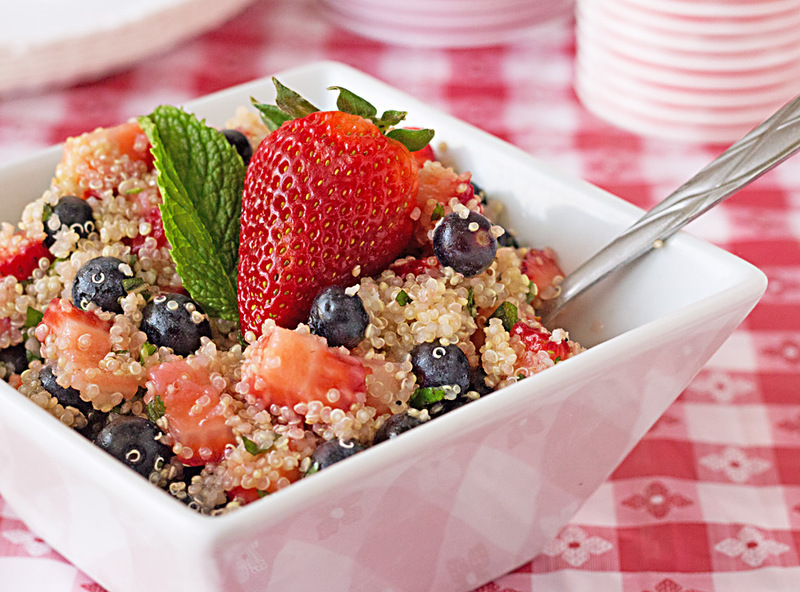 This patriotic quinoa salad will be the hit of your Memorial Day or Independence Day party. 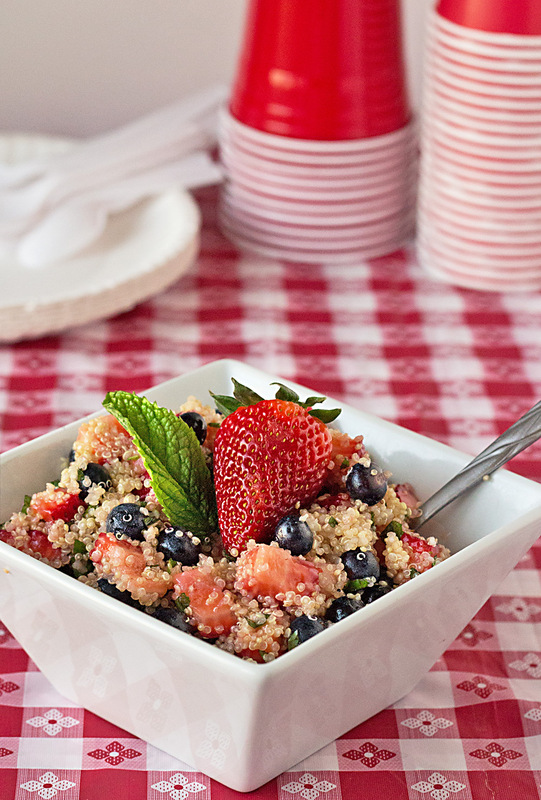 Fresh berries and quinoa are tossed in citrus vinaigrette. Yum! 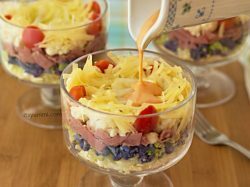 Don’t miss out on a single recipe of this kick off to summer! In addition to my patriotic quinoa fruit salad, here are the other recipes being shared today. Please click through and visit these awesome bloggers! I’ll have another delicious recipe for you on Thursday, for a delicious dessert that’ll be a BANG at your Memorial Day and 4th of July parties. I hope you’ll come back and see me! Do I wait for the quinoa to cool or add everything while it’s still hot? You can make the fruit salad while the quinoa is warm if you want to. Quinoa cools down pretty quickly, though, or you can place it into a bowl over an ice water bath to help it cool down quickly. I made this yummy salad for a 4th of July party last year. I’ve been asked to bring it again! This was amazing!! So simple and easy so I credited you when I wrote about it! Too good not to share:) you can check it out if you want. Thank you so much for sharing it, Kellye. Happy 4th of July to you. This salad is so colorful! I can’t wait to try it! Thanks so much! I loved the fresh colors and tastes of it! I hope you give it a try some time, Lauren! Quinoa is a great alternative to rice…less carbs (sugar) and more protein, and really delicious! I have never tried Quinoa but this salad makes me want to! I hope you give it a try, Summer! Quinoa has the consistency of REALLY light, fluffy rice. It’s much lighter than that, though. SO delicious! This looks delicious and something kids of all ages would enjoy! Would love to add a link to it (with proper credit of course to my Farmer’s Market Friday menu plan for “Memorial Day Picnic” next week! Thank you, Renee! As long as it’s just a link and my content is not used, I’d love and appreciate the share! What a festive salad! 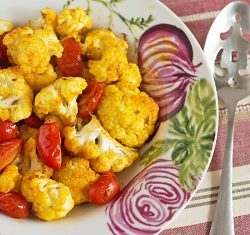 Another delicious way to use quinoa!!! This is so colorful & fun! This sounds really tasty, Becca…I would never have thought about adding fruit to a quinoa salad, but now I totally need to make this! Perfect for summer! Well, if that isn’t just about the prettiest salad I’ve seen in a good while. Love the mix of fruit and flavors, Becca! I never did quinoa salad myself yet. Have to give a try as soon as we have fresh strawberries. I hope you’re able to make it… and enjoy it, Indre! This looks so good! I havent tried quinoa with anything sweet yet so I can’t wait to try this recipe! YUM! Thanks, Kelley! I’m beginning to think that quinoa is a delicious sponge, because it doesn’t taste like much on its own, but it seems to soak up the flavors of whatever it’s paired with! Thank you so much, Kaylin! I hope you enjoy it. Have fun at those cookouts! I’ve tried many times to jump on the quinoa train but it keeps leaving the station without me. It’s frustrating because I know it’s healthy but I just haven’t liked any of the recipes I’ve tried. If anyone can develop a recipe I’ll like I know it’s you.